Download Project report on Wastewater treatment and plant design in PDF. Also, download seminar report on Wastewater Treatment. Sewage treatment, or domestic wastewater treatment, is the process of removing contaminants from wastewater, both runoff (effluents) and domestic. It includes physical, chemical and biological processes to remove physical, chemical and biological contaminants. Its objective is to produce a waste stream (or treated effluent) and a solid waste or sludge suitable for discharge or reuse back into the environment. This material is often inadvertently contaminated with many toxic organic and inorganic compounds. Sewage is created by residences, institutions, hospitals and commercial and industrial establishments. It can be treated close to where it is created (in septic tanks, biofilters or aerobic treatment systems), or collected and transported via a network of pipes and pump stations to a municipal treatment plant (see sewerage and pipes and infrastructure). Sewage collection and treatment is typically subject to local, state and federal regulations and standards. 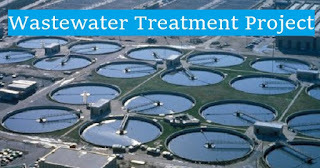 Industrial sources of wastewater often require specialized treatment processes. The overall design of the wastewater treatment plant consists of 4 stages: i)Primary treatment which consists of screening, grit removal and sedimentation ii)Secondary treatment consists of a bioreactor iii)Tertiary treatment consists of nitrogen removal, adsorption, and pH control. the aims of this project are to study the feasibility of implementing a wastewater treatment plant for an industrial wastewater possessing certain specified characteristics and simultaneously device certain processing strategies that will enable compliance of the treated water with the irrigation norms. The design project consists of two parts namely a ‘Preliminary report’ (Design Project 1) and a ‘Detailed report’ (Design Project 2). This detailed design is a follow up of the previous preliminary design conducted and it deals with the review of all the limitations of the design 1. The results obtained previously are fine-tuned and mechanical designs of the major equipment are prepared.